Safe digging in the palm of your hand: Watch the video tutorial. It’s fast and convenient to submit your locate requests online. Just select the appropriate button below and proceed to submit a new locate ticket! Following the requirements of Oregon’s excavation laws is vital to safety of underground facilities, workers and the public. If you believe these requirements are not being followed, we encourage you to file a complaint to report the probable violation. Investigation of probable violations is complaint driven and administered by the OPUC. You can initiate this process by submitting a Request for Administrative Action (RAA) using this form (Link to form here please) or by contacting the PUC at (503) 378-6600 or 1-800-522-2404. You will be asked a series of questions and the information you provide in response will be forwarded to staff for investigation. Additional information, such as scans of photos or other documents, can be emailed to the PUC if required. Once enough information has been collected, staff will take appropriate action. Thanks for your commitment to making Oregon a safe place to live and work. In time for spring gardening and home improvement projects, Governor Kate Brown proclaims April as “Oregon Dig Safely Month”. 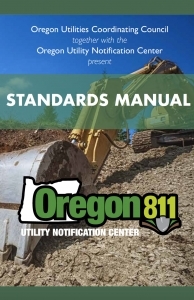 This serves as a reminder to all Oregon homeowners and contractors to call811 before digging to have underground facilities, such as natural gas pipelines, electrical utilities,telecommunication systems, as well as sewer and water lines marked. Oregon 811 is social! Stay up to date on the latest news and events by visiting our Facebook page. Follow us on Facebook! Visit the National Ticket Management System to search and manage tickets. To view or create new damage reports, visit the Substructure Damage Reporting page on the Oregon Utilities Coordinating Council website. Welcome to the Oregon Utility Notification Center website. We have included a large amount of information about Call Before You Dig Issues, Oregon’s Excavation Laws, the Board of Directors, Enforcement Actions, links to other websites of interest and a variety of other information. Our goal is to keep this site intuitive and easy to use so that you can quickly find the specific information that you may be seeking. It is our continuing mission to improve public safety by promoting all facets of excavation safety. We would like to have your comments on the usefulness of our website, or any suggestions you may have for improvements. Thank you for visiting us, and please tell your friends.